Our plastic surgeons offer several educational and informative seminars highlighting the contemporary approaches to cosmetic and plastic surgery of the face and body at The Ritz-Carlton Beach Resort in Naples, Florida and also at the Marco Island Marriott Hotel in Marco Island, Florida. A lite lunch is provided. To attend one of these FREE informative seminars, visit our website, The Aesthetic Surgery Center, Naples Florida and fill out the online form or call our office at 239-594-9100. The Florida Society of Facial Plastic and Reconstructive Surgery annual meeting was held in Naples, FL, this past weekend. The keynote speaker was Dr. Daniel Alam, from the Cleveland Clinic. He was the lead surgeon who performed the first U.S. face transplant and is the surgeon who is currently caring for the victim of last year’s chimpanzee attack. Between October 15, 2010 and December 31, 2010, you can receive a $50 rebate per 1mL syringe of Restylane (minimum purchase of 2 syringes required) or $75 rebate off of each 1mL of Perlane used in your treatment (minimum purchase of 1 syringe required), up to 6mL per visit (potential $450 value). Call The Aesthetic Surgery Center in Naples Florida at 800.594.7472 to schedule your Restylane and Perlane treatment between now and the end of the year to take advantage of this limited time offer. Dr. Anurag Agarwal, a Naples Florida Facial Plastic Surgeon, talks about his practice on Fox4 Morning. Dr. Agarwal is skilled at performing state-of-the-art facial plastic surgical procedures, such as endoscopic facelifts, Laserwash™ skin resurfacing, laser eyelid surgery (blepharoplasty), rhinoplasty, and hair restoration. He also offers non-surgical treatments such as Botox Cosmetic and injectable fillers. The contemporary approach to restoring and enhancing the face and body is the signature of The Aesthetic Surgery Center in Naples Florida. Please join us for an educational seminar about the latest advances in plastic surgery of the face and body. On Thursday, July 15, 2010, our physicians and staff will host a seminar at our office with refreshments at 5:30pm, a computer presentation from 6 to 7:15pm, and then a live Arctic laser peel demonstration at 7:15pm. This is the perfect opportunity to see our office, have one on one time with our physicians and staff, and learn about contemporary approaches to enhancing the face and body. What are the options for fuller, more youthful cheeks? Hallmarks of youth are full, balanced cheeks that give the face a heart shaped contour. During the aging process, the cheeks descend and deflate, giving a squared off configuration to the face with heaviness in the jowls. The endoscopic midface lift is the ideal procedure to restore cheek fat pads to their youthful configuration. If one has a gaunt, thin face, cheek implants can be used to permanently and safely augment the upper cheeks, volumizing the face. Semi-permanent options include fat transfer, while temporary options include injectable fillers such as Perlane, Radiesse and Sculptra. Consult with one of our double board certified facial plastic surgeons to see which procedure is best for your face. Dr. Agarwal recently attended the 10th International Symposium of Facial Plastic Surgery. Regardless of the topic (i.e. rhinoplasty, blepharoplasty, endoscopic facelifts combined with fat transfer, etc...), it was clear that the goals of a facial plastic surgical procedure must dictate the approach and technique. The concepts of facial deflation and descent were stressed in terms of facial analysis, as well as the importance of utilizing photographs of a patient 20-30 years prior when planning a facial rejuvenation procedure. Concepts that are currently used at The Aesthetic Surgery Center, including volume conservation and replacement with fat repositioning during an endoscopic midface lift and/or fat transfer were highlighted. It was also noted that while injectables and lasers are constantly evolving, there are no significant new revolutionary procedures or products at this time. The procedures/products/services currently offered at The Aesthetic Surgery Center are the state of the art. 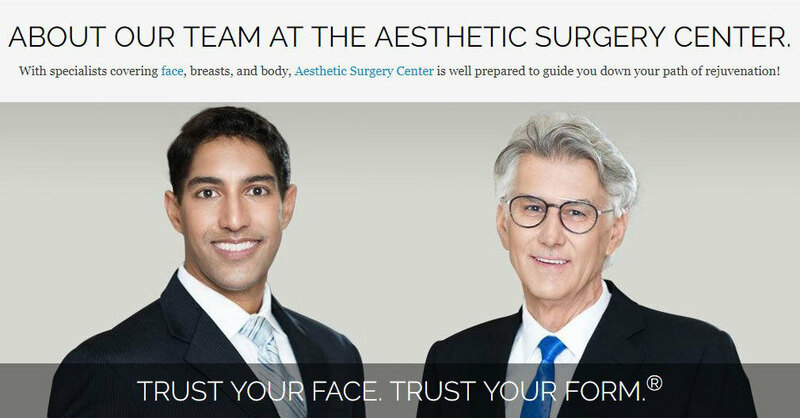 If you have any questions, or would like to schedule a consultation with Dr. Anurag Agarwal or Dr. Richard Maloney at The Aesthetic Surgery Center in Naples, Florida, please call 239-594-9100 or visit our website, The Aesthetic Surgery Center. The Naples Daily News is running the annual Southwest Florida Choice awards. Please vote for Dr. Maloney and The Aesthetic Surgery Center and Face Spa. Voting ends Sunday, May 9th. Click here to register and cast your vote! Dr. Agarwal and Dr. Maloney Publish Novel Technique on Muscle Transfer to the Lips in "The Archives of Facial Plastic Surgery"
In the March/April 2010 issue of "The Archives of Facial Plastic Surgery," Drs. Agarwal and Maloney published the first ever report on the technique of Sternocleidomastoid Muscle Transfer to the Lips. Dr. Maloney has been performing this procedure since 1995, and Dr. Agarwal has been performing this procedure since 2005. The procedure utilizes your own tissue to augment the lips, resulting in a long lasting, natural feel and appearance to the lips. Recently, My FOX News Tampa featured Dr. Anurag Agarwal about the new muscle transfer technique. View the video segment and watch Dr. Agarwal as he is interviewed about this exciting technique to enhance the lips with natural results. Join us for our last plastic surgery beachside seminar this season at The Ritz-Carlton Beach Resort in Naples on April 22nd, 2010. Our plastic surgeons offer several educational and informative seminars highlighting the contemporary approaches to cosmetic and plastic surgery of the face and body at The Ritz-Carlton Beach Resort in Naples, Florida. A lite lunch is provided. To attend the last beachside seminar this season, visit our website, The Aesthetic Surgery Center, and fill out the online form or call our office at 239-594-9100. Dr. Maloney's Signature Skin Moisturizer is a unique moisturizer with hyaluronic acid and liposomes, packed with soy isoflavones, which are potent anti-oxidants. Signature Skin is ideally used twice daily as a moisturizer. Each tube is priced at $120, so until May 31, 2010, you will receive TWO tubes for the price of one. Please take advantage of this limited time offer and stock up for the summer before you head north. CHICAGO – Augmenting the lips with grafts of muscle and connective tissue from the neck appears to result in improved appearance for at least two years, according to a report in the March/April issue of Archives of Facial Plastic Surgery, one of the JAMA/Archives journals. “The quest for the ideal permanent lip augmentation procedure has been fraught with challenges,” they continue, including resorption, asymmetry, reactions, extrusion, an unnatural feel or appearance and the formation of cysts. Anurag Agarwal, M.D., of The Aesthetic Surgery Center, Naples, Fla., and colleagues report on the results of 25 consecutive patients who underwent lip augmentation with segments of their own sternocleidomastoid, a muscle running along the side of the neck, and the connective tissue that overlies it (fascia). All patients had a minimum follow-up of one year. After an average of two years, the amount of vermilion showing increased by an average of 20 percent to 24 percent for the upper and lower lip. In addition, the average projection of the upper and lower lip increased by an average of 0.9 to 0.99 millimeters. The patients were subjectively pleased with the results, although one requested additional lip augmentation with an injectable gel. The muscle and fascia can be removed during a concurrent face lift with few complications, the authors note, and are readily incorporated by the lip. There were no deformities in lip contour, limitations in head movement, neck pain or nerve injuries associated with the grafts. “The postoperative recovery after sternocleidomastoid fascia and muscle grafts to the lips is straightforward,” the authors write. “After the first month of lip swelling, the patient should expect that the lips will still be slightly swollen. The senior author’s experience has been that approximately 75 percent of the immediate intraoperative lip fullness is maintained at one month post-operatively, while approximately 50 percent of the immediate intraoperative lip fullness is maintained at one year postoperatively.” The surgeon must account for this decrease in the size of grafts initially implanted, they note. “With careful patient selection and surgical technique, sternocleidomastoid muscle and fascia implantation is a valuable tool when treating the aging lip,” the authors conclude. In February 2010, Jane Iredale Mineral Cosmetics received the prestigious Seal of Recommendation from The Skin Cancer Foundation on five of its most popular products. The Seal of Recommendation has become the respected standard for ensuring the safety and efficacy of ultraviolet (UV) protection products. The 5 products that will bear the seal include: Amazing Base, PurePressed Base, Dream Tint, LipDrink and Powder-Me SPF in Tanned & Translucent. At the Aesthetic Surgery Center, Jane Iredale Mineral Cosmetics is our premier make-up line. We are thrilled that these products are now recommended by The Skin Cancer Foundation. Call (239) 594-9100 to order these great products or stop by our office! There is extensive literature supporting the use of Retin-A in rejuvenating photoaged skin. Retin-A results in epidermal thickening of the outer layer of skin, increased production of hyaluronan, which is a major component of skin, increased DNA synthesis, and increased cell turnover and replacement of sun damaged cells. At the Aesthetic Surgery Center, we believe in physician directed skin care. Our board certified facial plastic surgeons work with our licensed aestheticians in formulating a simple, yet effective skin care regimen custom designed to suit your skin’s needs. Recently, FOX News featured Dr. Anurag Agarwal about the new Perma Facial Implant for permanent lip augmentation. View the video segment and watch Dr. Agarwal as he is interviewed about this exciting in-office procedure to enhance the lips with natural results. Allergan, manufacturer of Juvederm Injectable Gel, has introduced a Juvederm product with Lidocaine (Juvederm XC Ultra), which results in less painful injections. Because the new product numbs the area that is treated as it is being injected, the entire injectable process is even more tolerable. Our physicians are now using Juvederm XC (as well as Restylane) for filling smile lines, lips, and tear troughs. Call today (239) 594-9100 to schedule your treatment with this exciting new product!